Last week we took a look back at the very beginning of the mobile trend in pharmacy point-of-sale. And many of our regular blog readers thought "So what?". If you aren't operating an outpatient pharmacy, how does all that really apply if you aren't trying to run a meds-to-beds program? As we learned very early on with the release of our EvolutionPOS register, mobile technology didn't just solve a big problem for outpatient pharmacies. It also filled gaps for independent and independent chain pharmacies across the country. In fact, independent pharmacies were some of the first customers to implement mobile technology, taking "cutting edge technology" to a whole new level. Over the years, we've seen RMS customers use EvolutionPOS and the EvolutionPOSV2 Tablet in many different ways. Here are some of our favorite uses for mobile technology in a retail landscape. Curbside - Curbside pickup or something like it is everywhere these days. Grocery stores, big box retailers, even hardware stores are getting the picture that convenience and time savings are key considerations for customers. For pharmacies, we've seen curbside delivery take off as well. Especially for pharmacies that don't have a drive-thru. 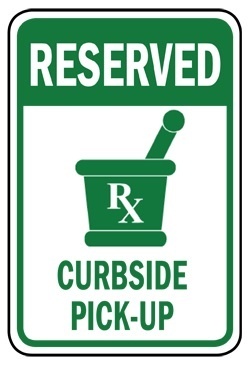 Curbside services offer customers a convenient way to pick up prescriptions. As this article outlines, implementing curbside pickup can create customer loyalty and give you an edge over the competition. On the sales floor - Shopping at a pharmacy is not always a quick shopping experience. Sure, sometimes customers might just be picking up a prescription. But what if they are looking for advice on supplements or looking for something in the DME department? In those cases, a pharmacy staff member is likely working with them to make sure they get the right products. Why break the interaction and send the customer to wait in line if you don't have to? Using a tablet on the sales floor, employees can close out a sale without interruption. It ensures the customer doesn't walk out the door and creates a lasting impression of the interaction. At the register - The same theory that works on the sales floor holds true at the cash register as well. Besides being a space saver, using a tablet instead of a traditional register unchains the transaction from the front counter. For instance, if you are recommending supplements based on nutrient depletion, you can take the tablet, walk the customer to the supplement aisle, and complete the purchase right there instead of running back and forth. You'll increase average ticket size and improve patient outcomes. (Keeping them coming back to your pharmacy). The best thing about mobile technology in your retail pharmacy is that a single mobile register can be used for many different purposes. A small investment can go a long way to driving sales and increasing profitability in your pharmacy. Retail Management Solutions is the industry leader in pharmacy point of sale technology for retail and outpatient pharmacies. having installed more pharmacy POS systems in the independent and outpatient pharmacies than any other company, RMS has become the industry standard. Whether you operate a single register pharmacy, 15 register superstore, or have multiple locations, we have a fit for you. You can count on us for prompt service in all 50 states, 24 hours a day, seven days a week. RMS is proud to be the only pharmacy POS provider in the nation that focuses strictly on the pharmacy market.